When I added the Campion Christmas stories to the festive reading blog, I realised that I hadn’t ever written a Series I love post about Margery Allingham’s detective and so one was really somewhat overdue. So, to start off the new year, I’m putting that omission to rights. Albert Campion – not his real name – is a detective and problem solver. He’s got an aristocratic background that is hinted and and has to be pieced together* – and many sources say he started as a parody of my beloved Lord Peter Wimsey. Indeed as well as their family history, their physical description is fairly similar – Campion is thin, blond, wears glasses and has a face that is described as bland and inoffensive and as having a deceptively blank expression. Wimsey by contrast is describes as being fair, average height, with a monocle and with a vaguely foolish face. You see what I mean? But as the books go on Albert is definitely his own man and a character in his own right. He’s more of an adventurer and a man of action than many of his Golden Age Counterparts – and more often on the edge of the law. Where Wimsey has Bunter – a gentleman’s gentleman with a flare for photography and chemistry – Albert has Lugg, an ex-con with a passion for trying to better himself but constantly being reminded of his past as he and Albert encounter his former criminal associates. Albert’s friend in the police is the detective Stanislas Oates, who over the course of the series rises through the ranks of The Yard to become its chief. The Campion stories tend more towards the adventure than straight up detective fiction – for example, my particular favourite is Sweet Danger which sees Albert posing as minor royalty at a foreign watering home and then attempting to outwit a criminal mastermind in the hunt for documents to prove who the ruler of a tiny but oil rich principality is. There are chases, and a treasure hunt, and evil machinations and attempted witchcraft and it all builds to a very satisfactory conclusion. The one in the series which gets most attention is The Tiger in the Smoke – which is a thriller not a detective novel – as Albert tries to track down a psychopath in foggy, smoggy London. I also really like The Fashion in Shrouds, in which Albert’s fashion designer sister (also estranged from the aristocratic family) falls under suspicion after two deaths that are rather convenient for her best friend. The series started in the 1930s and ran through until the 1960s, so I need to add my usual caveat about there being some dated attitudes and language in some of these – particularly the Fashion in Shrouds if I recall correctly – which means that the modern reader needs to approach with slight caution, but I don’t think there’s anything worse here than there is in Christie or Sayers. There are 19 Campion novels written by Margery Allingham, two more written by her husband (who completed the final Allingham novel after her death) and then another five modern continuations by Mike Ripley. I’ve read most of the Allingham written stories – although interestingly I think Campion’s first appearance, as a side character in The Crime at Black Dudley, is one of the ones in the series that I haven’t read. I can almost see your puzzled face at this – but I have an explanation: I discovered Campion when I was living in Essex and on a very tight budget. I was reading my way through the local library’s detective selection and they had a whole shelf of Campions – because Margery Allingham was a local author. I promptly read my way through as many as I could lay my hands on – but it was pre-goodreads and I wasn’t keeping track. I still don’t own many of them – a fact which has hampered me not inconsiderably in putting this post together! There were also two series of TV adaptations in the early 1990s, starring Peter Davison as Campion, which do occasionally pop up on TV (usually on Alibi or Drama) which are fun if not entirely faithful to the plot and a bit clunking in places. They’re definitely not as well put together as the Joan Hickson Miss Marples for example, the David Suchet Poirots or the Inspector Alleyn adaptations, but if you like the books then they’re worth a look as a curiosity if nothing else. I’ve got a couple of Campions as audiobooks too which has actually been a really nice way to revisit the series. Once I get my audiobook and podcast backlogs back down and under control, I’m planning to get a few more – and fill in some of the gaps in the series. If you’ve read any Campion books – or have a favourite – let me know in the comments! *And I can’t remember all the pieces at the moment! Not a lot of reading done last week – I started the week in New York and ended it on a plane back to Washington from Dallas and there wasn’t a lot of reading time other than the travelling. But luckily, I had an easy choice for my BotW pick thanks to my new local library and Carl Hiaasen’s Skin Tight. After a Mick Stranahan stabs his unexpected guest (who came armed) using a taxidermied fish, he starts to try to figure out who it is who wants him dead. Unfortunately the intruder died so quickly he couldn’t answer any questions. And there are plenty of suspects. As an investigator at the State Attorney’s Office there were plenty of people who had a grudge against him even before he nailed a crooked judge and got fired. But then the list just keeps growing and soon it becomes clear that if Stranahan wants to enjoy his retirement, he’s going to have to figure out what’s going on before he ends up dead. If that sounds a bit mad, that’s because it is. It’s a dark and satirical screwball comedy where every character has at least one serious character flaw, but very few of them realise it. I’ve spoken a lot about my search for more books to scratch my Steph Plum-esque itch and this definitely did that. Stranahan is much less likeable than Steph and a lot further from the straight and narrow than she is, but this is the same sort of madcap adventure you get with her. My only real problem with Skin Tight is that it was published nearly 30 years ago and that’s making it hard to get more books by Hiaasen, although not impossible as my to-read pile will already show. It does mean though that the bad news is that Skin Tight isn’t available on Kindle or Kobo at the moment – and it may well be out of print in the US as well as the UK. It is available on audiobook from Kobo, but if you want an actual book you’re going to have to buy it secondhand (Amazon and Abebooks have plenty of copies at various price points) or do what I did and get it from your library. This week’s BotW returns to my old stomping ground of Girl’s Own fiction. However it is slightly out of my usual wheel house in that it’s not a school story, but a career book. Compared to my reading of school stories, I haven’t read many career books, but one of my favourite books that my mum passed on from her childhood was Shirley Flight, Air Hostess so a book in a series called Sally Baxter, Girl Reporter definitely appealed to me. I found it in the Oxfam Bookshop in York (on the same trip that I picked up two Oxenhams and Dorita Fairlie Bruce) and I bought it, because after all, I am a journalist after spending my childhood pretending to be one, so what could be more perfect? !But this is definitely a recommendation for people who are afficiados of the genre – because it has some… let’s call them issues. So, Strangers in Fleet Street is apparently the 15th book in the Sally Baxter series and it sees Sally, who is a teenager working as a reporter at a national newspaper, taking charge of a group of foreign readers of the Evening Cry (her paper) who won a competition to spend two weeks in London. She’s their guide – but she’s also hoping to get some stories from their visit. Sally soon makes friends with most of the visitors but a series of disappearances – of money, of earrings and of a person – lead to suspicion being thrown on her little group and Sally is determined to unmask the real culprit – not just for the scoop but to save her new friend’s reputations. This ticked pretty much all of my boxes – it’s got a mystery and a bit of adventure. It has a fun cast of characters and it has a lead character who is doing an interesting job, in a male-dominated profession. OK Sally may be on human interest duty in this book, but she’s definitely doing the job and she’s not the only one – there’s a more senior woman reporter too. Looking at the information about the other titles in the series that I found here, it seems that Sally seems to get a lot of the softer stories – as opposed to crime, trials or politics, but then court rooms and council meetings are hard to make sound exciting – but a lot of it involves globe-trotting. Even without that list, Sally mentions trips to Hong Kong and North Africa – so it does sound like an exciting and appealing life, which has got to be one of the major aims of a career novel. My quibbles with it are all around some of the rather old-fashioned (putting it nicely) attitudes. Sally herself is very fair but the way the young North African boy is portrayed is definitely very stereotypical and of its time. And the resolution to the mystery involved another trope that I’m not very keen on, but I can’t say more than that because it’s a huge spoiler. So lets say that I won’t be lending this to my 10-year-old niece. But if you are a fan of Girl’s Own fiction and know where its weaknesses and blind spots are, this is a very enjoyable way to spend a few hours. And I’ve already been on the second hand book sites looking for more in the series. As I mentioned, my book came from a charity bookshop, the secondhand dealers have lots of copies of various books in this series (please don’t beat me to them) but unless this is your secret niche book love, it’s probably not going to be one for you- and if it is, you already know how to source this sort of thing, so no links this week! This may be one of the least surprising BotW picks ever, considering that the first book in the Custard Protocol series was a BotW, as were several of Gail Carriger’s other books (Sumage Solution, Manners and Mutiny and Timeless) and she was one of my discoveries of the year back when this blog was but a child. In fact, the only question you have may be: What took me so long to read Imprudence, given that it came out in July last year. Fear not. There are answers ahead. Now, part of the reason this has taken so long for me to read is that it was all boxed up with the to-read pile at the back end of last year, but the reason it was still waiting to be read at that point was a line in the blurb: “her werewolf father is crazy”. Having read Carriger’s Parasol Protectorate series, I had a fair idea what was going on there, and I was worried about how it was going to resolve itself. I love and adore Rue’s Paw – Conall Maccon and although he has his stupid moments (to whit, his idiotic behaviour in Blameless) I was a bit worried about what might happen to him. And I had a few rocky moments early on in the book, which involved near tears and sniffling. But I got through it and I was ok. And that’s as much as I can say without it all being a big old spoiler. And while we’re talking about the Parasol Protectorate, I found myself wishing that I’d re-read Timeless before I read this, because a lot of the action is in Egypt and there’s a lot of references to the events of that book. It did all come back to me, but I think I would have been cooing with delight sooner if I’d done a reread first. And so of course now I need to go and do that reread to check if there were any references that I missed in Imprudence. There are old friends here – and some who are less friendly. If I have a quibble, it’s that everything is wrapped up very quickly in the end – the main romantic through line and the adventure-quest one. I could have read another 50 pages of that resolving itself. But maybe that’s just me. And if you’re wondering what prompted me to read this now, it’s the fact that the latest novella that Carriger has written is set after this book, and I *really* want to read that and so needed to do things in order. Because I’m like that. And we all know that I’ll be pre-ordering the next in this series, Competence, just as soon as there’s a paperback preorder link. Because I’m like that too. As always in posts like this, I’m going to remind you all that this is the second in this series, but really actually the seventh if you’re counting Parasol Protectorate (which as you may have guessed have a fair bit to do with this) and eleventh if you’re going chronologically and including the spin-off prequel Finishing School YA series. So don’t start with this one. If you’re impatience, go and read Prudence first, but really, what you want to do is start with Soulless and work your way through Alexia’s story before you come to Rue. And then do the Finishing school, because that is so much more fun once you start to work out who everyone is and how it all fits together. Just my two-penneth. They’re all available in Kindle and Kobo and Audible* and you should be able to order the paperbacks from any good bookshop. Like the Big Green Bookshop. *Although NB, the first audiobook pronounces Lord Akeldama’s name wrong. It’s Ak-el-dama not A-keel-duhma or however she says it. It’s fixed by book 2 and I can just about cope with it in book one, even if my brain does repeat it pronounced correctly after every time it’s used. 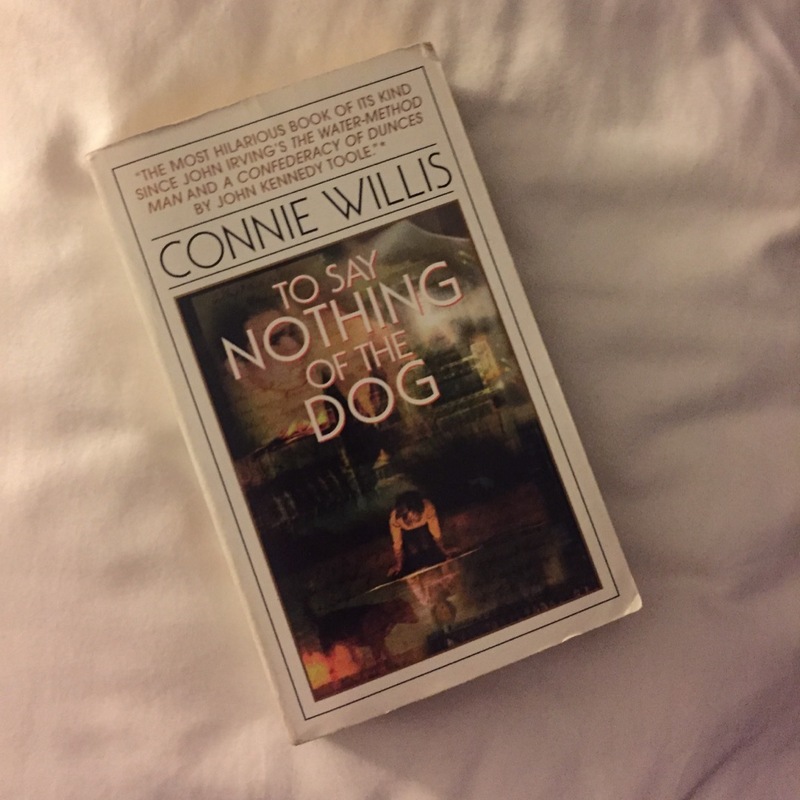 Lots of painting and filling and cleaning in my week off work, and not as much reading as usual, but in the end it was an easy choice for this week’s BotW – Connie Willis’s To Say Nothing of the Dog. Delightfully this was a recommendation from a work colleague who thought I would love it and he was totally right. I love it when that happens. Ned Henry has time-lag. He’s been shuttling between the 21st century and the 1940s trying to find a hideous artefact in the ruins of Coventry cathedral. But all those jumps have scrambled his brain and he’s sent to Victorian England to recover away from the demands of Lady Schrapnell – who is rebuilding the original Coventry cathedral in the middle of Oxford. The bad news is he has one job to do in the nineteenth century before he can relax. The trouble is, the time-lag means he can’t remember what it is. There’s a boat trip, eccentric dons, drippy maidens, dopey undergrads, a cat and a fellow time traveller called Verity Kindle. I loved this so much. It’s got so much of my catnip in here: it’s got modern people having to grapple with the Victorian era, it’s full of references to other books – of particular interest to me through thread of Peter Wimsey and Golden Age crime novels – and a mystery adventure plot as they try and hunt down the Bishop’s Bird Stump and prevent the future from being altered because of their actions. To recap: time travel, history, humour, literary in-jokes and Peter Wimsey references galore. What more could I want? This was my first Connie Willis book, so now the research is going on to figure out which of her other novels might be my cup of tea. If you like the Chronicles of St Mary’s series, by Jodi Taylor, you should definitely try this but I can’t think of many other books to compare this to (If you have any other suggestions for fun time travelling novels please do let me know) although I think if you like steampunky novels this might work for you, ditto books full of references to books. I need to go and read Three Men in a Boat because that’s a big influence here, and I’ve never read it. I also need to go and buy myself a copy of this because I want one for myself so I can lend it and I’m going to have to give this copy back. You can get a copy of To Say Nothing of the Dog from all the usual sources. You may have noticed that a week on the beach means that I’ve read a lot of books and whilst I have been bingeing a little on Jodi Taylor’s Chronicles of St Mary’s series (and Margery Allingham to a lesser extent) my favourite book last week was Dave Sinclair’s The Barista’s Guide to Espionage. 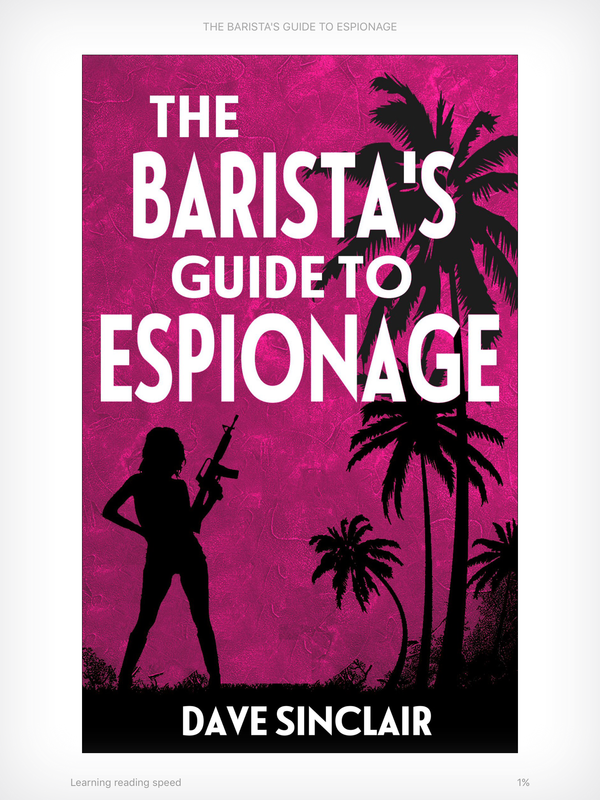 I’ve said elsewhere that this book is what would happen if Stephanie Plum had James Bond’s baby – and according to the publisher that was what the author was going for, so big success there. How can you not love a book with a cover like this?! This is so, so, so much fun. I mean, Eva blazes through this book, living up to her name with the trail of wreckage in her wake. And Harry the Billionaire is really well done – he has enough moments of being really human that you can see why Eva struggles to side against him at time – he’s not like a Bond villain were you know the only reason he’s attracted his female hangers-on is because he’s rich*. This unravels like an action movie – with set pieces scattered across the world and bluffs and double bluffs galore. I can’t wait for the sequel – and hopefully the movie. This was another book which came to me via my Fahrenheit Press subscription – which has already given me previous BotW’s Murder Quadrille, Black Rubber Dress and Death of a Nobody as well as a bunch of other excellent books which have been in the running. Fahrenheit Press are starting to bring out physical copies of their books, but as yet, the only place you can get this is on Kindle but it’s definitely worth £2.95 of your hard-earned money. *Except May Day. I think she likes Zorin because he’s mad and lets her be violent (and he’s rich, and younger than most Bond villains).